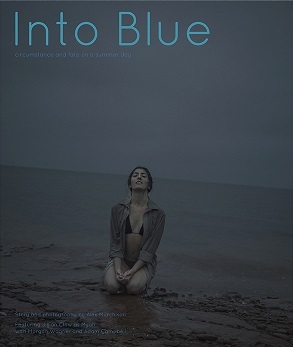 Delving into the world of photocomics last year, I was excited to stumble upon Prince Edward Island photographer Alex Murchison's Into Blue: Circumstances and Fate on a Summer Day. It's a short book that falls somewhere between a picture book (though aimed at adults) and a comic. It doesn't have all of the usual comic book features (lacking speech balloons and gutters, for example) but it does have sequential pictures and more than one photo per page which are pretty much equivalent to panels. There is text in the sidebars that tell a story but in conjunction with the photos. 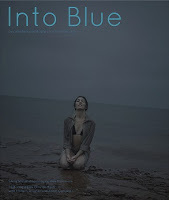 The photos are quite well done; crisp, and artistic, with an great actress/model helping capture some of the emotion. The photography itself also convey emotion especially with the lighting turning darker as the story delves into darker content. It is a story about a woman seeming to take an innocent stroll along a beach. She soon, however, happens upon an unpleasant mystery and in turn is reminded that she too was trying to escape from something unpleasant in her own life.A downer? Perhaps, but still adroitly told. Reader's Diary #2021: Youssef Dadudi: Monk!